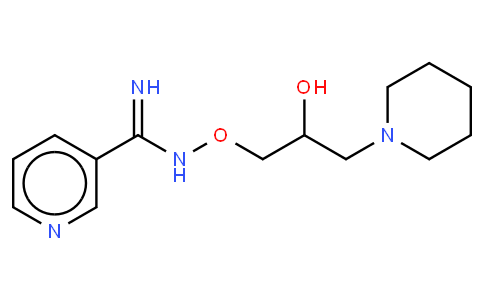 BGP-15, is a nicotinic amidoxime derivative with PARP inhibitory activity. It has been demonstrated that BGP-15 protects against ischemia-reperfusion injury. BGP-15 improves cardiac function and reduces arrhythmic episodes in two independent mouse models, which progressively develop HF and AF. BGP-15 administered in 100-200 mg/kg oral doses shortly before cisplatin treatment either prevented or significantly inhibited the development of cisplatin-induced acute renal failure. BGP-15 had a significant effect on the antioxidant status of kidney during cisplatin-induced nephrotoxicity. It elevated the decreased glutathione and catalase levels, but did not affect SOD activity. BGP-15 treatment decreased the cisplatin-caused ROS production and restored the level of high energy phosphate intermediates. While BGP-15 protected against cisplatin-induced nephrotoxicity, it did not reduce the antitumor efficacy of this cytostatic agent. BGP-15 increased the survival of cisplatin-treated P-388 leukemia bearing mice. BGP-15 inhibits the cisplatin-induced poly-ADP-ribosylation in the kidney. At the same time, BGP-15 restored the cisplatin-induced disturbance in energy metabolism and preserved the ATP level in the protected tissue.